A Summertime Sale – 10% Off! Enter coupon code EXTRA10 at checkout to apply the 10% off discount on your total order before taxes (if applicable). This discount code is applicable to U.S. residents only. 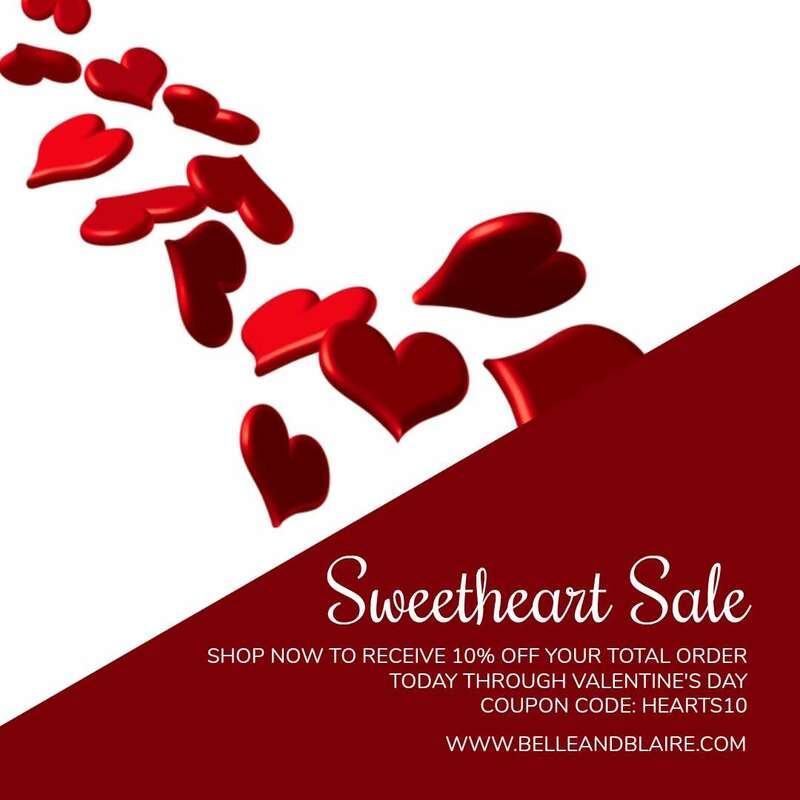 This coupon cannot be used in conjunction with other coupons and is valid to use at BELLEANDBLAIRE.COM only. 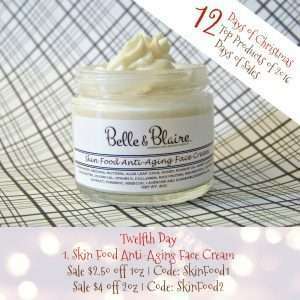 Our most popular product of 2016 is the Skin Food Anti-Aging Face Cream. This mature skin cream is made up of pure natural ingredients that delivers superior moisture and a renewed glow to the skin. The special cream will help reduce the appearance of fine lines and wrinkles. Recommended for normal, dry and aging skin. Experts suggest women who have subjected their skin to sun damage in the first two decades of life should start anti-aging treatment immediately. Daily sun protection, serums, creams and lotions with skin-beneficial ingredients will make a big difference in maintaining healthy, youthful looking skin. Enter code ‘SKINCARE1‘ to get $2.50 off of a 1oz jar and enter code ‘SKINCARE2‘ to get $4 off of a 2oz jar. • Valid from 12/12/16 to 12/14/16 – Extended 2 Additional Days! Our second most popular product of 2016 is Butter Beer Lip Balm. 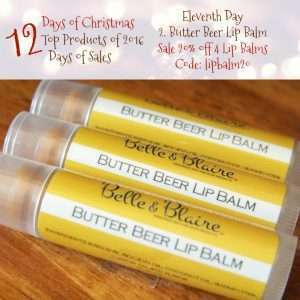 In fact, we’ve sold more Butter Beer Lip Balm than any other product over the last 2 years. What can we say, it’s a fan favorite! Lip balm soothes dry or chapped lips, and also protect the delicate skin of your mouth from harsh temperatures and other factors that could irritate your lips. Made in small batches with fewer ingredients than other types of lip balm, you will know and understand what you’re putting on your lips. Our lip balm provides superior moisture for your lips that glides on smoothly and the buttery feel is all you need to keep your lips moist and hydrated. Enter code ‘LIPBALM20‘ at checkout and get 20% off any four (4) lip balms of your choice. A perfect stocking stuffer gift. • Valid from 12/11/16 to 12/12/16 – 2 DAYS LEFT! Our third most popular product of 2016 is the Anti-Cellulite Cream. This firming anti-cellulite cream was formulated to help smooth, firm and tone problematic skin areas. It works perfectly for stretch marks and it detoxifies while it replenishes the skin of vital nutrients to help fight cellulite and stretch marks. Pair up the Anti-Cellulite Cream with Anti-Cellulite Caffeine Scrub to help smooth, firm and tone your problematic skin areas. Enter code ‘ANTICC3‘ to receive $3.00 off the Anti-Cellulite Cream. • Valid from 12/10/16 to 12/12/16 – 3 DAYS LEFT! Our fourth most popular product of 2016 is Insane Vanilla Linen & Body Spray. This multi-purpose aromatic Linen & Body Spray is safe to use on your pillows, sheets and comforters as well as misting on your body as a refreshing cooling spray. Made with natural and gentle skin safe ingredients, our Linen & Body Spray will not discolor your linens or irritate your skin. We recommend using the Linen & Body Spray whenever you want an aroma pick-me-up to reduce anxiety, ease depression and boost energy levels. Available to buy in one of our most popular fragrances, Insane Vanilla, or choose from our large selection of fragrances. Enter code ‘LBS15‘ at checkout to get 15% off. Our fifth most popular product of 2016 is the Teeth Whitening Treatment. You can absolutely have whiter teeth with our charcoal activated Teeth Whitening Treatment. Made with all natural ingredients of activated charcoal, raw coconut oil and essential oils, this paste will whiten and brighten your smile without irritating your mouth and gums. Activated charcoal is charcoal that has been “activated” to increase its absorptive properties. In addition to naturally absorbing chemicals and toxins from the body, activated charcoal is a great holistic alternative to various health and beauty products (such as face masks and teeth whiteners). Many alternative dental health products use activated charcoal instead of fluoride since long-term fluoride ingestion can have harmful effects on the body. 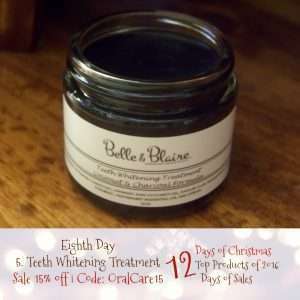 We’re offering the Charcoal Activated Teeth Whitening Treatment and the Warm Spice Tooth Powder for 15% off each. Enter code “ORALCARE15” at checkout. 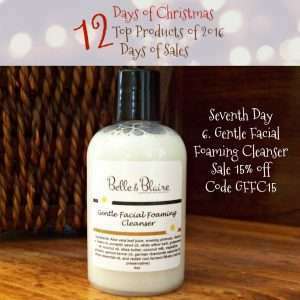 Our sixth most popular product of 2016 is the Gentle Facial Foaming Cleanser. Made with all natural ingredients, our coconut milk based cleanser is gentle and an effective moisturizer. Coconut milk can alleviate wrinkles and give the skin an overall firmer appearance. It’s made up of protein, copper, and distinctive fatty acids that help fight free radicals our skin is exposed to. Coconut milk does not discriminate, it is great for all skin types to soothe minor skin conditions. The fatty acids in coconut milk aids in moisturizing and nourishing the skin; and it’s exceptionally great for oily skin because the fatty acids is a natural antiseptic to prevent clogged pores. That means you can clean and hydrate your skin at the same time! Use discount code ‘GFFC15′ at checkout to get 15% off the Gentle Facial Foaming Cleanser. 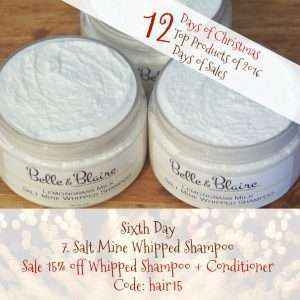 Our seventh most popular product of 2016 is Salt Mine Whipped Shampoo because it is all the rage! It’s one of our most popular products because it works. Made with natural sea salt to eliminated excess oil, this wonderfully scented blend of lemongrass and coconut with a hint of sweet honey shampoo will leave your hair feeling thoroughly cleansed and your mood energized & upbeat. Sea salt is recommended as a natural remedy for people with oily hair. Our other whipped shampoo option is Creamy Lentils Whipped Shampoo. Recommended for normal, dry and chemically treated hair; it is an excellent source for hydration that gives the hair a high shine and an extra added bounce while it conditions. Try our Whipped Shampoos and Hydrate Conditioner by receiving 15% off when you enter code ‘HAIR15‘ at checkout. Our eighth most popular product of 2016 is Cherry Almond Whipped Soap and Sugar Scrub. Cherry Almond Whipped Soap and Sugar Scrub has been part of our bath & body collection from the start. Cherry Almond was one of our original fragrances and it remains a fan favorite 5 years later. Cherry Almond carries notes of black cherries and almonds while boasting a fruity and nutty aroma. Our whipped soap moisturizing cleanser has a creamy, rich bubbly lather. It holds a scent wonderfully while making your skin feeling silky and soft. For exfoliation we added sugar which naturally removes dead skin and leaves skin glowing and healthy. Get to know our Cherry Almond Whipped Soap, Sugar Scrub and Perfume Oil better by entering code ‘CHERRYALMOND15‘ at checkout to receive 15% off of our selected Cherry Almond products. 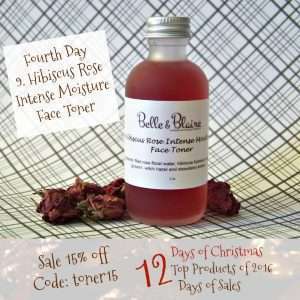 Our ninth most popular product of 2016 is Hibiscus Rose Intense Moisture Face Toner. We introduced this product earlier this year and it has been a hit ever since! Made with 100% pure natural ingredients, this fantastic facial toner is very gentle and moisturizing to the skin. It is all natural with nothing but plant ingredients and plant extracts. Boasts a heavenly aroma of fresh rose and strawberry extract that is super moisturizing to calm the skin and the senses. Choose any fragrance from our collection of Facial Toners then enter code ‘TONER15‘ at checkout to receive 15% off.